Location: In front of the Stoa of Zeus Eleutherios, in the central area of the Agora, by the Panathenaic Way, which stretches to the north and east of the monument. No 2 in the Agora plan of the Guide: Camp II, J., The Athenian Agora, A Short Guide to the Excavations, Excavations of the Athenian Agora, Picture Book no 16, American School of Classical Studies (Princeton 2003), p. 2 and pp. 24-25. The Altar of the Twelve Gods is an important monument of the Agora. This was the central milestone from which all distances in Attica were calculated. Unfortunately, due to the fact that it is partly situated beneath the cutting of the Metropolitan Railway, it is minimally visible today, while our knowledge on it is limited. The monument was excavated in 1891, during the digging for the Metropolitan Railway, and Dörpfeld initially identified it as the Leokoreion. Excavations were resumed in 1934 by the American School of Classical studies, and it was then correctly identified. The site was cleared and a stratigraphical examination was conducted in 1946 on the south end of the altar. 9/10 of the monument lie under the Railway, and only its southwest corner is visible today. This part of the site was cleared anew in 1989. The identification of the monument was made possible by the discovery of an inscription on a marble statue base found in the area of the altar. The inscription reads: “Leagros, son of Glaukon, dedicated (the statue) to the Twelve Gods”. This Leagros is a historical figure; he was an Athenian general after 480 BC and was killed in 461 BC during an abortive campaign in Thrace. The altar, according to Thucydides’ testimony, was dedicated by Peisistratos the Younger, son of Hippias, in 522/521 BC, when he was holding the office of the eponymous archon. In 519 BC, the Plataeans sought asylum there, as did later Pheidias’ associates, when they were accused of embezzlement. This was a popular place of asylum. 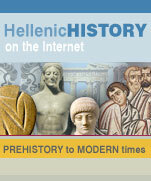 It also served as Athens’ central milestone, i.e. 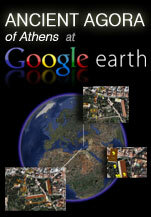 it was considered to be the heart of the Agora and of the city of Athens. It consisted in a quadrilateral enclosure (peribolos), almost square in plan. The enclosure features two archaeologically discrete phases, but their dating is problematic. Of the first phase, the crepidoma, its so-called lower crepidoma, measuring 9.35 (E-W) x 9.85m (N-S) survives in a –comparatively– exceptional condition in the excavated parts – only two blocks are missing. It comprises large soft yellow poros blocks, joined without the use of clamps. Their size varies, ranging between 0.33-0.40m in height, 1.30-1.80m in length and 0.45-0.465m in width. Part of the crepidoma rests on the bedrock and part on the ground. Only the upper layer of the blocks bears signs of treatment, which would have obviously been visible to a height of 0.10m. In terms of absolute height, the lower crepidoma lies at 52.525 (its top) and at 52.19 to 52.14m (its base) above the sea level. The upper surface of the crepidoma preserves cuttings for fitting the bases of the pilasters of each side, while in between there are dowel holes for the attachment of the orthostatai. No doubt pilasters and the orthostatai would have had the same coping, which, in the drawings of the excavators, is represented based on that in the Monument of the Eponymous Heroes. Nothing remains of the parapet. In all likelihood it too would have been made up of poros. It has been calculated that each side comprised 8 pilasters, spaced out every 0.97m, with the exception of the middle pilasters in the west side, between which an opening of 1.37m existed, obviously the entrance to the monument. A concavity in the centre of this space indicates that some sort of wooden post barred the entrance. Of the altar of the first phase remain only some poros fragments: three of these (Α 1198, Α 1199a and b), discovered in the epichosis of the later parapet, a part of the coping with a thin taenia and cyma, as well as two fragments from the helix formed on the top of the altar. A suggestion was made to represent it in accordance with a small base surviving on the northern slope of the Acropolis, inside the Beulé Gate. Although of modest dimensions (1.025m in length x 0.645m in width x 0.405m in height), it is made up of the same material, also culminates in helices and is roughly dated to the 5th cent. BC. Its surface is coated with a red pigment. Other poros fragments discovered scattered around the altar could possibly belong to orthostatai. On the west side of the peribolos, almost adjoining the outer side of the parapet’s euthenteria, survives the aforementioned rectangular statue base. It supported a bronze statue, as indicated by the mortises surviving on its upper part – the statue probably stood with the left foot slightly advanced. Apparently the statue was carefully removed. Seventy percent of the base was covered when the second parapet was constructed. For the placement of the base on its original spot the lower crepidoma was partially converted, and this, according to the excavators, proves that the peribolos predated its installation. It was removed and installed in its final place with the construction of the second parapet, the upper part of which bears no signs of wear and tear. A red figure kylix from the Museum of Baltimore depicts a mature man observing the statue of a young athlete. The inscription “Leagros” could refer to the statue, or, according to another view, to the statue as well as to the mature man, Leagros himself late in life. The vase, however, together with most of the pottery inscriptions mentioning Leagros as kalos, that is a beautiful youth, are dated to 500 BC. Several changes are incorporated in the second phase of the monument. Firstly the ground level is raised to the height of the lower crepidoma in the west and to by 0.20m in the south. This crepidoma is made up of yellow poros and now serves as a foundation for the new crepidoma, the so-called upper crepidoma, constructed of grey poros blocks joined without clamps. Their dimensions are 1.16-1.50m in length, 0.38m in width and 0.295m in height. The absolute height of the upper crepidoma is 52.85m (its top) and 52,525m (its base) above the sea level. The entire south side and the south part of its east side survive, and are still visible today. The dimensions of the peribolos change too: it now measures 9.05m (E-W) x 9.86m (N-S). Nothing remains of its superstructure, and this may indicate that after the sack of Athens by the Heruli the surviving building material was carefully removed and used elsewhere. Dowel holes and cuttings on the upper surface of the crepidoma suggest the existence of a parapet rather similar to that of the previous phase, although the support and joining techniques for the architectural members differ. There were 8 pilasters on each side, with two entrances now, one on the east and one on the west side, according to the most reliable representation. The corner pilasters though, as well as the pilasters flanking the entrance, are now more securely supported thanks to the use of lead clamps, while the orthostatai rest on the pilasters and not only on the crepidoma. The small thickness that corresponds to the orthostatai indicates that these were made up of marble and not of poros stone. Poros stone, though, will have probably been used for the pilasters as well as for the continuous coping. The total height must have been at least 1m and the coping similar to that in the Monument of the Eponymous Heroes. At their bases, the pilasters measured 0.285 x 0.215m. From their traces on the crepidoma it appears that the orthostatai flanking the entrances in the east and west side were thicker at their base (0.14m) that on their top (0.08m). The suggested explanation is that they bore relief decoration. Judging from the cuttings on the crepidoma, the second orthostate from the south part of the east side was slightly thinner. The two orthostatai flanking the entrance were apparently wider than the rest, so as to accommodate the sculptural decoration. In the south side the width of the orthostatai was 0.945m, on the west side 0.97m, while the central part/entrance had an opening of 1.59m, minus 0.08m in total for the revetment of the entrance. In the south part of the east side, the orthostatai had a width of 0.96 and 0.88m respectively. This should have also been the case in the north section of this side. The distance between the pilasters in the east and west was 1.255m, and probably 1.230m in the south and north. Perhaps a part of the coping survives, if it is the one incorporated in a Late Roman building close to the Stoa Basileios (Α 3880). 1. Hermes, with Eurydice and Orpheus at the point when Orpheus turns to look back thereby looses his beloved Eurydice forever (copies in the Louvre, Naples, Rome, Thermae and Villa Albani). 2. The two daughters of Pelias, at the moment when they give Medea their consent to cut their father to pieces in order to rejuvenate him by tossing his body parts in a magic cauldron (Berlin and Laterano in Rome). 3. Peirithous (seated figure), Theseus and Hercules, the last coming to rescue them from their captivity in the Underworld (the Louvre and Torlonia in Rome). 4. Hercules seated on a rock together with two Hesperides in the Garden of the Hesperides (Villa Albani in Rome, and two fragments in New York and the Hermitage). During this phase the floor around the altar, which was made up of compacted earth, is covered with irregularly shaped poros slabs, their thickness ranging from 0.18 to 0.32m. Their height covers the height of the lower crepidoma. Thucydides mentions that the demos enlarged the length of the altar and effaced the inscription mentioning the name of Peisistratos the Younger. It is possible that the edges of the older altar were hewn off, and the altar enlarged and faced with marble in its front. A marble fragment from an altar has been unearthed near the monument and it is thought that it originates from the second altar. According to the original version of the altar’s history, the base of the Leagros statue was added after the construction of the building. Indeed, its upper part bears signs of wear due to its exposure to the natural elements. In 480 BC monument and statue were destroyed by the Persians. The monument was rebuilt and the second parapet was constructed half a century later. The duration of this phase remains unknown; the monument, however, is destroyed in the 3rd cent. AD. During the same century, a child-burial was made in the south part of the parapet. It is unclear whether it stood at the same spot, unless we accept Thompson’s theory, that the worship of Eleos (Pity) complemented or supplanted that of the Twelve Gods, as attested by Pausanias. Statius (90 AD) mentions the altar (claiming, however, that it was built by the sons of Hercules), which was surrounded by olive trees. To the west and the east, the excavators discovered holes (1m in diameter) in the ground filled with soft soil, probably for planting trees. To the west of the peribolos stands the base of a water basin (perirrhanterion), dated to the 4th cent. BC. This dating is not, however, supported by the results of the stratigraphical examination. According to Gadbery’s alternative suggestion, the base of the statue of Leagros bears signs of wear consonant with its long-term use. It was placed in the spot it occupies today in the third quarter of the 5th cent. BC, when the Altar of the Twelve Gods was rebuilt to its exact original dimensions, that is, before its destruction by the Persians in 480 BC. The statue was not destroyed because it was installed after 480 BC, most likely between 470 and 465/464 BC. Based on this theory, the addition of the later parapet is dated to the third quarter of the 4th cent. BC. A strong argument for this view is provided by the dated pottery found in the altar area, as well as from the fact that the closest parallel for a structure similar to the late parapet is the Monument of the Eponymous Heroes, which is now dated to the third quarter of the 4th cent. BC. A shortcoming of this theory, however, is that it implies that no trace of the original monument survives, positing that it was rebuilt using roughly the same material. 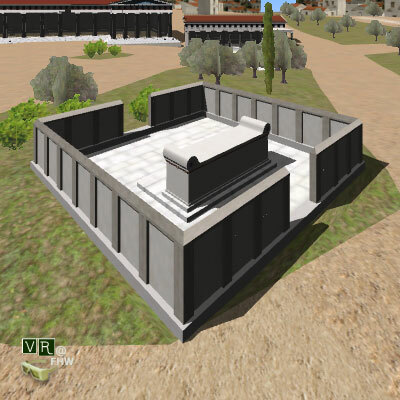 Close to the altar lies a rectangular hearth (ground altar) measuring 1.76 x 3.877m; this called an eschara. It is surrounded on all sides by yellow poros blocks, while internally it is filled with boulders. Its orientation matches that of the altar; it is made up of the same material, and should obviously be dated to the same period. Between these two monuments there is a narrow passageway of 0.80m. The Eschara lies to the west. The absolute height of the Eschara during its initial phase is calculated to 52.45/52.46m above the sea level, that is, very close to that of the original phase of the altar. At a later phase, the Eschara was covered with slabs, acquired a stone parapet and was raised by 0.10m. Mc CAMP II, J., The Athenian Agora: A Guide to the Excavation and Museum4 (Athens 1990). Μc CAMP II, J., The Athenian Agora, A Short Guide to the Excavations, Excavations of the Athenian Agora, Picture Book no 16, American School of Classical Studies (Princeton 2003), p. 8. Mc CAMP II, J., Η Αρχαία Αγορά της Αθήνας. Οι Ανασκαφές στην καρδιά της κλασικής πόλης2 (Αθήνα 2004), pp. 61-63. CROSBY, Μ., ‘The Altar of the Twelve Gods in Athens’, in Commemorative Studies in Honor of Theodore Leslie Shear, Hesperia Supplement 8 (Princeton 1949), pp. 82-103, plates 11-14. DÖRPFELD, W., Alt-Athen, I (Berlin 1936), p. 69 fig. ΙΙ, p. 137. GADBERY, L.M., ‘The Sanctuary of the Twelve Gods in the Athenian Agora: A Revised View’, Hesperia 61 (1992), pp. 447-489, plates 105-111. GÖTZE, H., ‘Die attischen Dreifigurenreliefs’, Römische Mitteilungen 53 (1938), pp. 189-280. HAUSMANN, U., Griechische Weihreliefs (Berlin 1960), pp. 48-50. SHEAR, T.L., ‘The Campaign of 1934’, Hesperia 4 (1935), pp. 340-370 (esp. pp. 355-358). 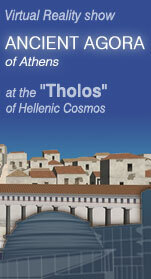 THOMPSON, H.A., ‘The Excavation of the Athenian Agora 1940-1946’, Hesperia 16 (1947), pp. 198-199, plate 49. THOMPSON, H.A., ‘The Altar of Pity in the Athenian Agora’, Hesperia 21 (1952), pp. 47-82, plates 14-18. THOMPSON, H.A. – WYCHERLEY, R., The Agora of Athens. The American Excavations in the Athenian Agora, vol. XIV, American School of Classical Studies at Athens (Princeton 1972), p. 119ff. TRAVLOS, J., Pictorial Dictionary of Ancient Athens (Princeton 1971). VON WILLAMOWITZ-MÖLLENDORF, U., Aus Kydathen, Philologische Untersuchungen I (Berlin 1880), p. 207. 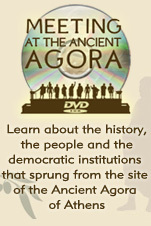 The project "Virtual Reality Digital Collection 'The Ancient Agora of Athens'" has been co-funded in a percentage of 80% by the European Regional Development Fund and in a percentage of 20% by state funds in the framework of the Operational Programme "Information Society" of the 3rd Community Support Framework.